All over the globe, members of Sweet Adelines International (SAI) are joining together for an Open House. This is an amazing group of real women, singing real harmony and having real fun. SAI encourages women all over the world to reach their full singing potential. There are unlimited training and educational opportunities, as well as a chance to perform and entertain. As a member, you will also discover fun social activities, an enlarged circle of friends, and exciting performance opportunities. at the Horizons Event Centre (behind the Mono Plaza, 4 km north of Orangeville). 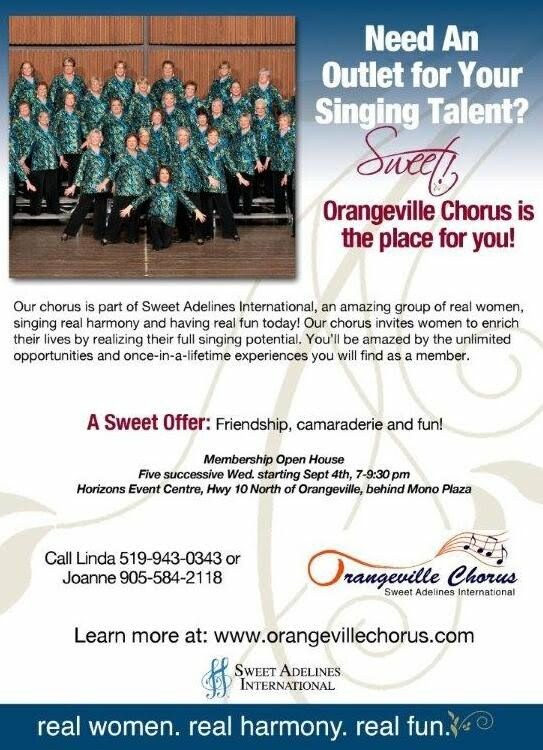 Or email membership@orangevillechorus.com for more information. Do you like to sing? SWEET!